Manor College is honoring Black History month with a lot of great educational and inspiring events and programs. 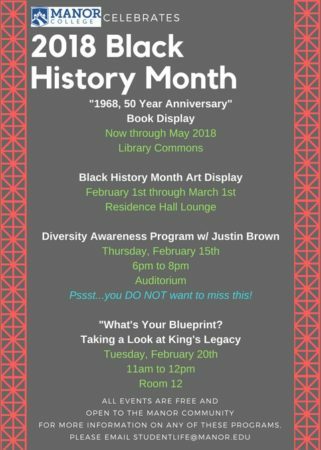 Here you will find all of the different programs, events and features that are happening on campus to celebrate Black History month! 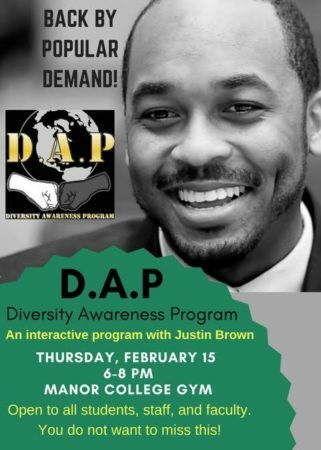 Student Engagement will be sponsoring a program entitled D.A.P-Diversity Awareness Program presented by Justin Brown. Mr. Brown performed at Manor College last year and students, staff, and faculty loved his program so much that we invited him back for part two! We also have everything from an inspiring book display in the Basileiad Library to art displays that are happening all month long!